If you think you can’t bake bread (which is probably a false notion, by the way), grissini are a sure-fire way to fast success. These thin bread sticks could not be simpler to make. If you love playing with dough, you’ll get plenty of opportunity here. And who doesn’t love their eminently nosh-able crunch, not to mention the visual panache a bouquet of these babies adds to the dinner table? The recipe, adapted from Baking Illustrated by the editors of Cook’s Illustrated magazine, uses a simple pizza dough. A food processor makes very short work of the mixing, but the dough may also be mixed by hand (7 to 8 minutes) or in a stand mixer (5 minutes). If you don’t need 64 grissini, refrigerate half the dough and make pizza for breakfast. Combine the flour, yeast, and salt in the bowl of a large food processor. Pulse a few times to combine. Combine the water and olive oil in a liquid measuring cup. With the processor running, add the liquid to the dry ingredients in a steady stream. Process until the dough is smooth and elastic, about 90 seconds. Place the dough in a lightly oiled container. Cover the container and let the dough ferment at room temperature until doubled in volume, about 1.5 – 2 hours. Preheat the oven to 350F. A baking stone and steam are not needed. Line a large baking sheet with parchment paper. Divide the dough into four equal pieces. The steps that follow will be repeated for each of the four pieces. Keep the pieces you’re not working with covered. On a floured counter, roll the dough out into a rectangle about 12 x 8 inches. The exact dimensions are not critical. 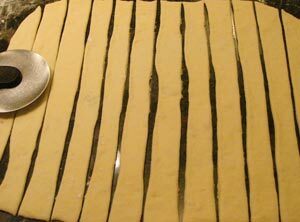 Cut the dough into 16 strips of equal width. A pizza cutter works very well for this. Fold each strip over on itself (according to Baking Illustrated, this makes it stronger). 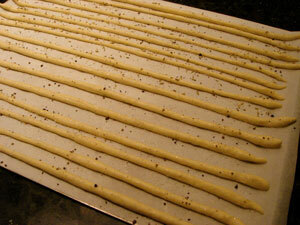 On an unfloured surface, roll the strip into a long snake. 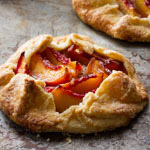 Make it a bit longer than the length of your baking sheet, to allow for spring-back. Place the snakes evenly spaced across the width of the parchment-lined baking sheet. 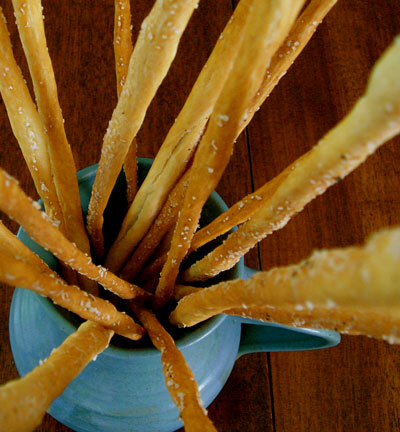 Lightly spray or brush the grissini with olive oil and sprinkle on the topping. Bake at 350F for 25 – 30 minutes, until golden brown. Cool on a wire rack. These are gorgeous. We had a restaurant who made grissini and had them waiting on the table when you sat down. I forgot about how wonderful that was until I saw your pretty photo. I see that you used commercial yeast for them. 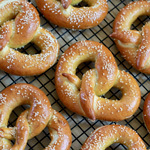 Have you ever used your wild yeast to make them? Please correct me if I’m wrong but they seem like they may be perfect candidates for the leftovers from feeding the starter. Maryann, thanks! I had fun with the photos. Mimi, to tell you the truth I used to make these a lot, but then I too kind of forgot about them until my husband requested them recently. It’s nice to have a memory jog now and then, isn’t it? Elizabeth, great idea. 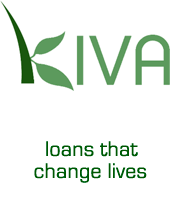 Will you volunteer to try it and let us know how it works? Susan great pictures and write up as usual! I have never tried to make grissini before! But dh’s birthday is coming up so that may be the inspiration along with your post!!! Love your grissini as well as the way your took photo of them. BZ, thanks and I’m sure you will create a wonderful birthday meal, with or without the bread sticks. Hi Kim, I’m glad you like the photo. I like the way the grissini look in the blue pitcher, which was made by my husband years ago. Nicole, I really do often make pizza for breakfast when I have leftover dough of any kind! My countertop oven is perfect for this. I’ve got a lot to learn from you! I can’t believe I haven’t gotten over here sooner, but just looking at your bread, I’m going to be reading a lot as I try to figure out this bread stuff. I love the photos. Elizabeth, no pressure, but if you do it I’d love to hear how it goes. 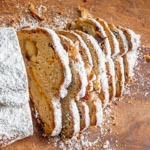 Curt, I have enjoyed your posts at Just Baking and I’m looking forward to seeing more bread from you there. Beautiful grissini. I love to serve these at a wine and cheese. They disappear so fast! Your grissini is wonderful. I have a recipe calling for these. Will be trying your recipe real soon! Aimee, they do go fast, don’t they? Thanks for stopping by! Anh, I’d love to see your recipe. Hi Farmgirl Susan, don’t be embarrassed; you’ve been busy baking a lot of other delicious breads! Farmgirl Susan, you MUST take the time to make breadsticks (I had never made them before a week or so ago either) They’re great! Wow, these look incredible. I’m sad to admit that I’m one of those people who think that they can’t make bread, but these look so yummy — definitely one I’ll try! Susan, in step number 10, you have, “Fold each strip over on itself”. This is a lengthwise fold, yes? Elizabeth, if by “lengthwise” you mean fold the strip so that its length is cut in half (e.g., an 8″ strip is now a double 4″ strip), then yes. Susan, I’m so glad I found this recipe! Can I make these ahead of time? Any thoughts on the best way to store these if I can? Oh!!! That’s what I did the first time and I thought that must be wrong. I guess I just didn’t roll them enough after folding them to make them really thin like yours. Susan, I thought you might be interested to hear that I have just weighed the “discarded amount” from building up my starter in preparation for making bread tomorrow. It is about 50gms. I’m guessing it’s usually that amount and that is probably how much I put into the pizza dough before making the bread sticks. Laura, they always get eaten pretty much right away in my house but I think it would be fine to make them a bit ahead and store them in an airtight container once cool. I’m guessing they would also freeze well. They’re already dried out, so no worries about that. Thanks for stopping by! Elizabeth, thanks for the info. I’m going to try it with the leftover starter. Love your photo of the grissini. 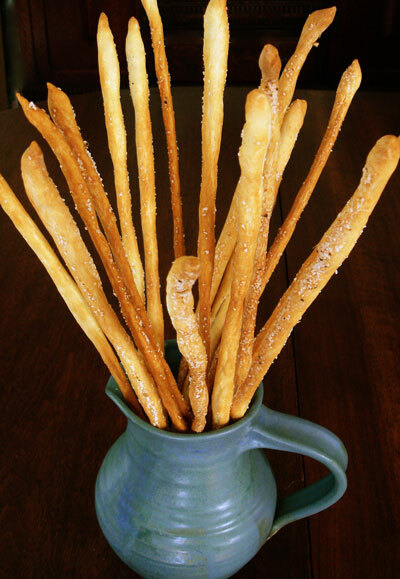 I made some from a Locatelli recipe recently – couldn’t stop just at one stick! j’adore tout ce que je vois mais je ne comprends pas l’anglais, sniffff…. cachou66, et je ne parle pas bon français. C’est dommage! Susan, I made these for my daughter’s birthday party and they were such a hit. I can definitely see why they don’t last long at your house 🙂 Thanks for this awesome recipe, I love it. Laura, I’m glad the recipe was a success for you. Thanks for letting me know! I am going to make these, I think maybe some pesto or cheesy breadsticks are in order! Bev, yours turned out great! I would like to know where to purchase these breadstix. I have heard great things about them but cannon find them in my area. I assume “t” means teaspoon. If that’s the case, why is 2 teaspoons the equivalent of 6.5 grams, while 1.5 teaspoons equals 9 grams? I don’t understand the metric system; perhaps my confusion is related to my ignorance. if you add the yeast to warm water as first step (perhaps with 1/5th of flour) and then add the oil without the water in a steady stream to mixing flour,salt,until all the oil has been absorbed, and then add yeasted water the proofing time could be reduced. Absolutely delicious breadsticks! And you know what? Two days later I needed bread in a hurry so I whipped the leftover refrigerated dough into a boule shape… let it rise, baked at 460 for 40 minutes (it needed tenting). 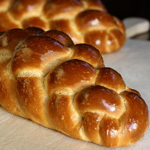 Awesome, tasty bread – thank you!!! Do you have to let the yeast start in a seprate container per yeast directions, or just combine with the dry ingredients as stated? 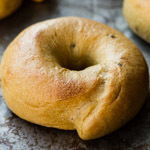 This recipe, like most of mine, calls for instant yeast but you can substitute active dry if that’s what you have; the above-referenced post gives the conversion factor. Some people swear you can just add active dry yeast right to the dough as you do instant. That is probably what I would do in this case, rather than trying to mix it with warm water first; I’m thinking warm water might make the dough too warm, since it is mixed in a food processor. I just stumbled across your recipe and I am SUPER excited to try it tomorrow. My mother always talks about those break sticks she used to have a kid. The ones that stood up in the cups; the ones like her grandma used to make. She is making chicken parmigiana tomorrow night for dinner and I’m going to surprise her with a batch of these!!! I can’t wait to see how they will turn out. Thanks so much for this lovely recipe! 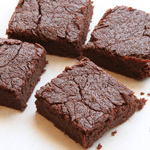 I just made these and baked them to the same color of your pics but they are very hard to eat ! Could this happen because my yeast is bad? I suspect it is, because the dough didn’t quite double. But, I’m a bit inexperienced to judge this. 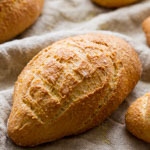 Hi Susan, i like the idea of bread sticks, but i am a whole wheat person myself, and was wondering, can i substitute all of the flour for whole wheat flour in the recipe, or have you got a recipe specifically for whole wheat bread sticks? I did look at the flax seed bread sticks recipe, but i cannot acquire flax seed at this moment. Thanks in advance. 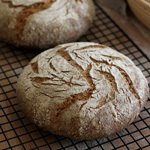 Waldron, you could use whole wheat flour but will probably need to increase the water a bit and bake them a little longer to make sure they’re dry. They are likely to have a denser texture than the originals. would this dough freeze well? i’m in the middle of planning a largely diy wedding reception, and i want to get started as early as possible on as much of the food as possible. if i started making these, would the dough be ok 6-7 weeks in the freezer? Ashley, I wouldn’t vouch for the performance of the dough after freezing it. Freezing kills off some yeast so you’d probably want to add more — but I’m not sure how much, as I don’t have much experience with frozen doughs. As with anything new for an important occasion, I’d definitely recommend a test run! Jes you can the dough four monds in de freezing. de yeast is not killing in de freezing. I made half a recipe of this yesterday for our New Year’s party and they were excellent. Takes no time at all and very simple to slot the making in during other prep during the day. They looked “perfick” on the table. I found that twisting the sticks rather than rolling was easiest and added a few minutes to baking time to compensate for the additional thickness. I’ll add a few different toppings next time. I recently discovered yeast, and now make three Ciabatta loaves a week. Sorry Mr Warburton. I always use fresh yeast, which I keep in pre weighed out 12 gram packs in the freezer. I make all my dough in 500 grams of flour lots using Canadian strong plain flour. I also make Croissants, Pain au Raisin (same dough) and since I saw your delicious looking Grissini, I’ll be having a go at those as well. Can’t wait. Wouldn’t it be easier to use 625g of flour and 400 g of water? Seems like you’re overcomplicating this whole thing? I burst into laughter when I read the ingredients and their amounts. And then I kept looking for a good recipe. These bread sticks are so tasty and crunchy. I halved the recipe so that I could make the dough in my bread machine and they turned out perfectly. Thanks for the recipe. If you only wanted to make half the amount of grissini at once, can you use the dough that’s refrigerated to make more grissini instead of flat bread? Copyright © 2007 - 2014 Wild Yeast.